At Twilio, we Start with the Why... why is diversity important? We believe a diverse workforce gives us a competitive edge to emerge as the most innovative communications platform company in the world. 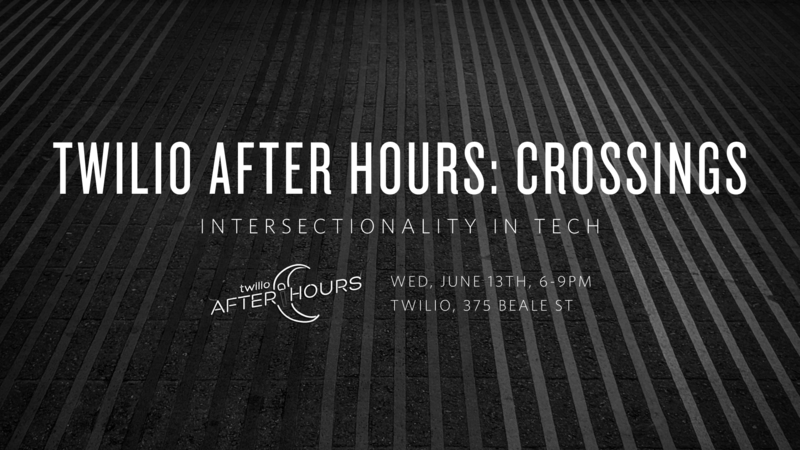 Twilio After Hours presents: Crossings, Intersectionality in Tech, a space where you can embrace the authentic you. Join us for an evening of music, food, drinks and networking. Come hear from our QTPOC (Queer, Trans, People of Color) Panel, Tech Entrepreneur: Ryan Leslie -- and what we’re doing to ensure we have a diverse and inclusive workplace. You will also have the chance to meet face-to-face with Recruiters, Hiring Managers, and to learn more about what Twilio can do for your career and why #YouBelongAtTwilio! The night includes a fireside chat, panel discussion, and networking. Free Drinks & Limited Supply of Food - Arrive Early! Ryan is a Grammy nominated recording artist, multi-platinum music producer, and avid technologist. In addition to logging studio time with Madonna, Jay-Z, Kanye West and Beyoncé, he is the architect and ultimate case study for his company Disruptive Multimedia’s simple CRM for creators, a Twilio-enabled product called SuperPhone. Bravely opting to remove his latest album from iTunes, he used an inbound SMS campaign to drive over $2MM in gross revenue by selling an album D2C to just 15K fans. He holds a BA in Government from Harvard and splits his time between New York, LA, Paris and Miami. Hailing from the land of Kim Kardashian, Liz's mission as a software developer is to disrupt tech itself by bringing attention to diversity and inclusion. In her previous lives, Liz was a ghost writer for a celebrity gossip blog, a wedding photographer, and a social media manager for a dog and cat magazine. Coming to tech via a nontraditional route, Liz takes none of her good fortune for granted, and is always pushing the envelope. She enjoys writing, snowboarding, pole dancing, Olympic lifting, and smashing the patriarchy. Liz is also an advocate for young breast cancer patients, trauma survivors, and access to mental health care. Dominique (Dom) DeGuzman is a community & self-taught software engineer with a background in systems engineering and public speaking. Dom jumped into software and tools development after a failed comedy career and years of provisioning development machines. After working on multiple Platform engineering teams, she now focuses on creating and maintaining product standards for reliability, scalability and security while helping maintain tools and infrastructure as a DevOps. Alongside development, Dom is one of the founding members of Twilio's diversity and inclusion initiative, runs a group called "Diversity Advocates", and previously heavily involved with organizations such as Lesbians Who Tech, Alliance Health Project and TurnOut. She spends her non-engineering time traveling speaking about diversity and inclusion, battling brogrammer culture, impostor syndrome, and encouraging more underrepresented minorities in the field to pursue a future in STEM. At Women 2.0, Matthew is focused on bringing comprehensive, measurable solutions to the diversity space. He is also the Founder & CEO of the nonprofit, Others Project; the first real-time, consolidated, and open-source initiative dedicated to Diversity + Inclusion data. Matthew’s background includes work as COO at both Jurispect, in regulatory FinTech compliance, and also at FWD.us, working towards intelligent immigration reform. He was on the Global Ethics and Compliance founding team at Google, where he had responsibility for training and investigations, metrics, and compliance technology procurement. Matthew currently serves as an Advisor to the Board for Project Include. Angie is a tech aficionado who loves building community and bringing people together. With a background in history, she is always finding ways to use tech to further social good and solve societal issues. That and she loves talking nerdy to just about anyone. As an advocate for diversity and inclusion, Angie regularly speaks and writes on the topic, helping companies reimagine their internal culture. She's currently the Director of Community at Lesbians Who Tech, a global community of over 40,000 queer technologists and the founder of Reboot America, an Oakland-based non-profit that builds comprehensive community solutions by bringing together technologists and researchers. RC Brown is a self-taught Software Engineer, who is currently a Program Manager at Hack the Hood. Hack the Hood is an Oakland non-profit organization where underrepresented youth gain access to technological opportunities. RC is a teacher, social justice activist and community builder. "We’re hiring in people that espouse our values. We’re making sure that people come in with the understanding that we don’t want shenanigans here. We want you to be humble here, we want you to ‘Draw the Owl,’ we want you to really acquire knowledge and thirst after it. If you keep hiring people like that, that already lend to your values, then you're going to continue to have that culture"
Sign in, grab a cocktail, help yourself to food, and network. What does diversity mean at Twilio?